Story: Alexander is a friend of the bee Maja. 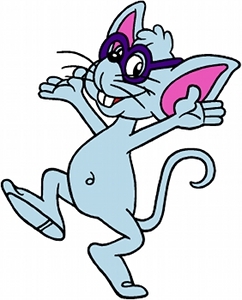 Background notes: Maja's friend Alexander was one of the characters created for the second cartoon series with Maja, from 1979. He was created by the writers Hikaru Sasa and Hitoshi Kanazawa and character designer Susumu Shiraume, and his German voice was done by Kurt Zips. Contrary to the first series, the second series was shown in Germany before being shown in Japan, even though it appears that it was produced by the same team and company as the first series. Alexander's first appearance in comics was in Die Biene Maja #81. The year of publication has not been obtainable, but it was around 1979-1980. It has not been possible to find any indications of Alexander appearing in any of the Biene Maja games. A single piece of merchandise with Alexander (a figurine) has been seen, most likely more merchandise can be found.